All the great features of the ExtraCarry Mag Pouch but now available for use with ASP-USA Expandable 16" Baton. The FireArmGuy has a new carry gun the Kahr P9. He's also still using the ExtraCarry Mag Pouch he received over a year ago which was designed for the Kahr. Turns out his new gun uses the same mags. So no need for a new ExtraCarry Mag Pouch. It's working perfectly with his new Kahr P9 magazine. All the great features of the ExtraCarry Mag Pouch but now available for use with UDAP Pepper Spray. Thank you Braden for taking the time to review the ExtraCarry™ Mag Pouch and for giving it 5 out of 5 Stars!! The Police Chief keeps you on the cutting edge of law enforcement technology with monthly product announcements. Items about new or improved products are based on news releases supplied by manufacturers and distributors; IACP endorsement is in no way implied. Very nice post of the Walther Forum about the ExtraCarry Magazine Pouch recently release for the Walther PPQ. You can now carry your spare magazine concealed are ready for easy access in your pocket. You can never have enough ammo. We sent out an ExtraCarry Mag Pouch to Rev. Kenn Blanchard "The Black Man With a Gun Show", aka The Urban Shooter to get his feedback. So far he says he, "Really, Really Like It". He will be posting a full review, stay tuned. Check out the ExtraCarry Mag Pouch in this unboxing video just posted by Green Light Shooting. We sent them an ExtraCarry to evaluate for the Springfield XD-s 45. Check back for their test results. Shouldn't be more than a couple of weeks. The patent pending, ExtraCarryTM Concealed Carry Magazine Pouch is now available for the Beretta Nano 6 and 8 round magazine. The best way to carry spare ammo for your concealed carry weapon. Lightweight and ambidextrous, slide it into any pocket and it looks unassuming just like any pocket knife with a pants clip. The ExtraCarryTM Mag Pouch securely locks into your pocket with its patent pending integrated clip. Your spare magazine is well hidden and rapidly available when you need it. The ExtraCarryTM Mag Pouch provides a deep pouch covering the magazine's first exposed round along with protecting the notch in the magazine which holds it in place in a pistol. No worries about foreign objects, like coins, dirt, debris, getting stuck between the magazine pouch and the magazine or dislodging a round that could easily cause a jam. The ExtracCarryTM Mag Pouch is manufactured using strong and flexible nylon and has an integrated spring steel pocket clip. They are made in the USA with retail prices starting at $50. They’re currently available for the 1911 (7 and 8 round), Beretta Nano (6 and 8 round), Colt Government 380, Colt Mustang 380, Glock 17/22, Glock 19/23, Glock 26/27/33, Glock 36, Glock 42 and 43, Keltec 3AT, Remington Rm390, Ruger LCP, S&W M&P Shield 40 and 9mm, S&W M&P Bodyguard 380, Sig Sauer P238, Springfield XD(m) 45 and 9mm and the Springfield XD-S 45 and 9MM. More variations are on the way. I stumbled upon another simple minimalist design geared towards those who conceal carry. The folks from ExtraCarry recently released their new line of concealed carry magazine pouches. Their new mag pouches are lightweight and ambidextrous and features a pocket clip, slide it into your pocket and it looks just like a pocket knife clipped onto your pants. At SHOT Show Ruger rolled out another improvement with the LCP Custom. Featuring a bright red aluminum trigger with a wide face. This new trigger is similar to popular aftermarket trigger upgrades for the LCP. Also a new set of sights. 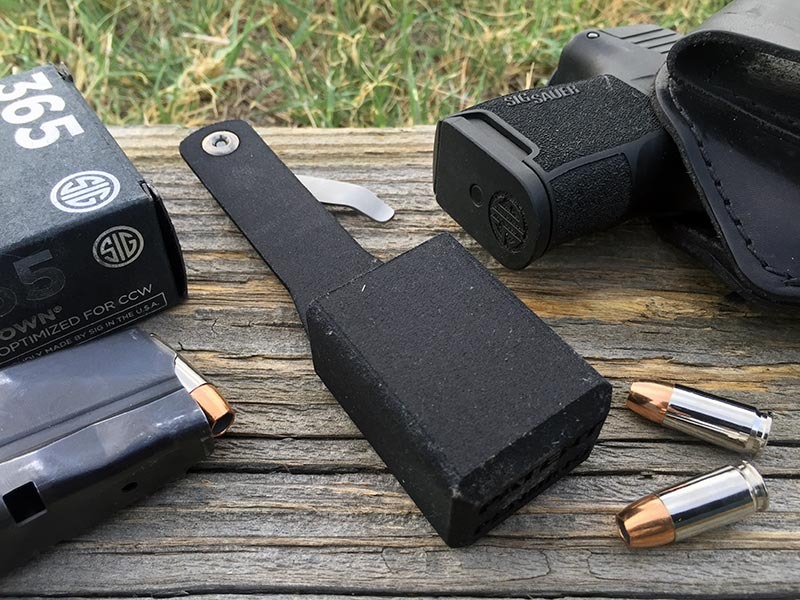 Need to carry a spare magazine for your LCP? The ExtraCarry Mag Pouch is ready to secure your spare magazine concealed in your pocket. Order your today for your Ruger LCP. The Lightweight Commander is available from the Colt factory. The pistol is great for conceal carry. It has a shorter profile and lower weight than the full-size Government Model. Novak sights, beavertail grip safety and extended safety lever and a few of the new features. The ExtraCarry Mag Pouch will work perfectly with this new addition to the Colt 1911 lineup. Order your ExtraCarry Mag Pouch today for your new Lightweight 1911 Commander. Springfield Armory introduced a new member of the Range Officer family with the new Operator model. The Operator includes forged national match frames and slides, both features found on Springfield Armory’s top-end 1911 models. A national match stainless steel barrel and precisely fit bushing help wring maximum accuracy from the Range Officer Operator. The ExtraCarry Mag Pouch is now available for the Springfield Operator 1911. I am a Law Enforcement officer and understand the importance of carrying a firearm while off-duty. I also understand the importance of carrying an extra magazine. Especially if the magazine your gun holds is single stack with limited rounds. Before I found the ExtraCarry mag pouch, I was carrying an extra magazine in a leather holder that slid on to my belt. The issue I had with this mag holder was how long it took to take the magazine out. This was due to the tightness of the leather mag holder which never seemed to loosen up. When speed is of the essence, you don’t want to be fumbling with/for your spare magazine. The ExtraCarry mag pouch allows me to easily carry my spare magazine in my front pocket. It is unobtrusive and the clip is very secure. I am able to get a firm grip on the magazine which allows me to then remove it quickly and easily from its pouch. I couldn’t be happier with the ExtraCarry mag pouch. I show it off and recommend it to all of my co-workers. Black Hills teamed up with Lehigh Defense to create the new Extreme Defense .380 ACP. The new .380 ACP use a 60 grain solid copper bullet, moving at about 1,150 fps at the muzzle, that is supposed to create a large wound cavity without expanding. The bullet design is similar to what Lehigh Defense already makes, but Black Hills uses different loads with different bullet weights. Browning introduced a new personal defense line of handgun ammo called BXP. The BXP Personal defense ammo uses an X-Point insert to help prevent the hollow point from clogging when passing through clothing or an intermediate barrier. The .380 ACP is 95 grain with a 1,000 fps at the muzzle. Federal is now making a .380 ACP Practice and Defend Combo packs. Each packages contain 100 rounds of FMJ practice ammunition plus an additional 20 rounds of HST defensive ammo. If you are carrying a .380 ACP in your pocket or on your hip, the ExtraCarry Mag Pouch is now available for a multitude of .380's. Order your ExtraCarry Concealed Carry Mag Pouch today.